Stoner is one of my friend Jane Moss’s favourite books – but I know of others haven’t enjoyed it. What would I make of if? Well, I devoured it in great chunks, like a binge eater with her head in the pantry. It was utterly mesmerising. 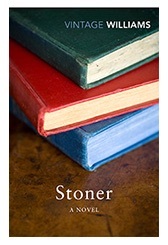 Stoner is a quiet and understated read, a bit like its main character, William Stoner. Stoner is a farm boy who in 1910 goes to college to study agricultural sciences and quietly falls in love with English Literature in a way that he cannot express. He ditches agriculture and switches to English Literature never to return to the homestead, but to embark on a career in academia. The passion for literature seems to lie locked inside of him, and you question whether it is the time or his upbringing that has it submerged, pouring out only at times. There are relatively few spells in Stoner’s life when he is bold – his proposal, his teaching, his decision about the war, and his eventual fight back into his role in the department. The rest of Stoner’s story is of a man repressed. Closed. Quiet. At one level nothing much happens in Stoner. It is a character lead novel, rather like the work of Elizabeth Jane Howard. There are tensions between Stoner and his wife, the strange friendship and the ghost of a mutual friend, and Stoner’s nemesis is the head of department, the magnificent Lomax. And then there is Stoner’s daughter – the change in their relationship I felt most keenly when Stoner’s fragile wife takes centre stage and pushes Stoner to the margins of the family. I wept for Stoner. There is joy in Stoner, but good things never seem to last long, and things end badly. Williams certainly made Stoner suffer. When Stoner is dying (and this is no spoiler since the book opens with a kind of obituary), he reflects on his life. Did he regret his life? Williams gives us a highly moving and insightful reflection, which had me questioning my appreciation of William Stoner as I had read. Perhaps this is the genius and joy of the book, this dilemma and my dissection and examination. Williams’ writing is brilliant. It is clean and quiet, you have the impression that every word has been carefully considered. Stoner is absorbing and clever. The micro examination of character is incredible, with Williams creating characters that walked off the page. When I finished the book I felt satisfied, and intrigued. I reflected long about what was the magic in the book, a book that was both tragic and hopeful. A book with passion and without. A book where I wondered if Stoner was hero or wuss. Stoner is a stunning novel.